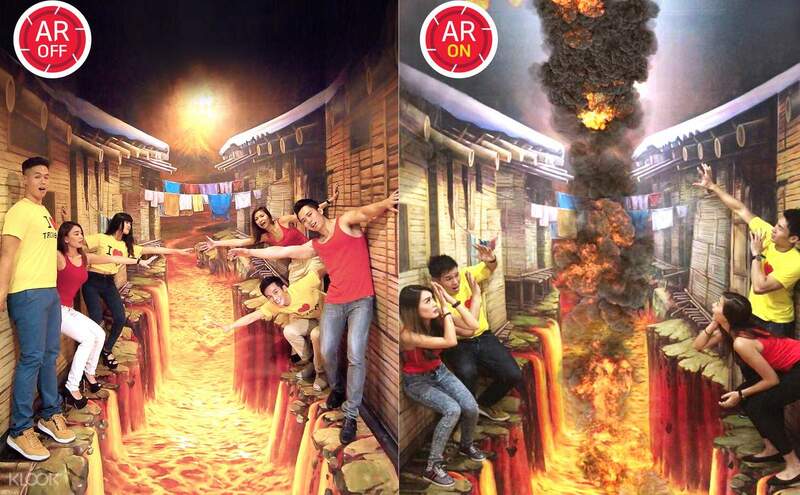 Let your imagination run wild at Trick Eye Museum in Singapore, an internationally-renowned 3D art museum from Korea. 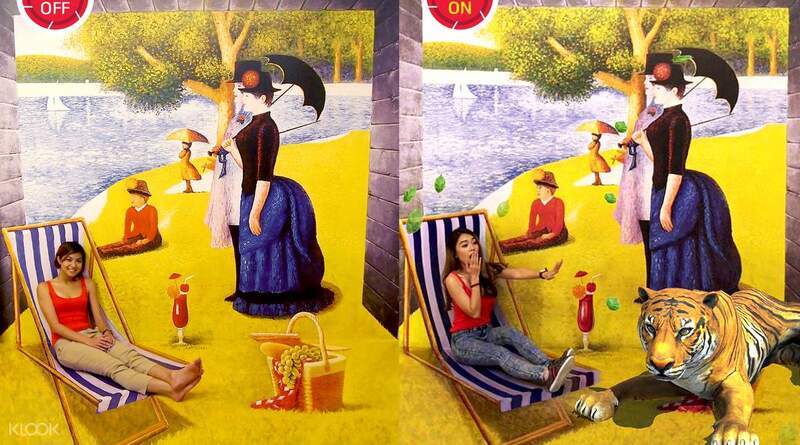 With its huge array of hand-painted art exhibits made by dedicated Korean artists, each exhibit comes alive with the use of a special art technique, called Trompe-l’oeil, that makes 2D art pop up into 3D! Feel, touch, and interact with the exhibits in 6 different zones, and enjoy a day filled with fun, laughter, adventure and excitement. 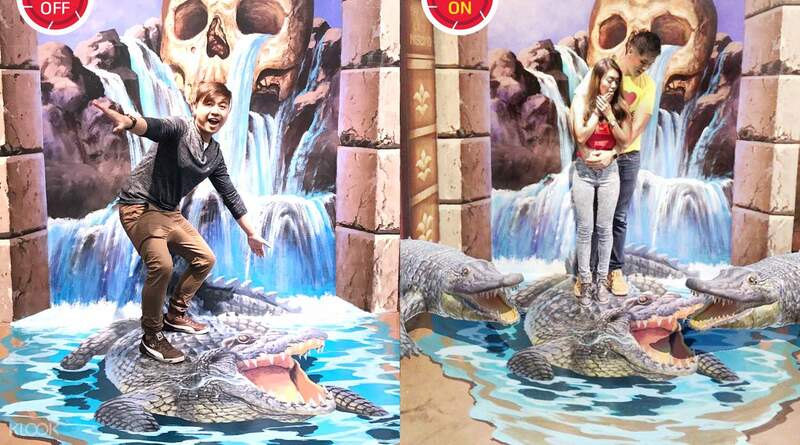 Get a heightened experience of the Trick Eye Museum with their very own Augmented Reality mobile app, where you'll see a whole new world of AR appear before your very eyes! 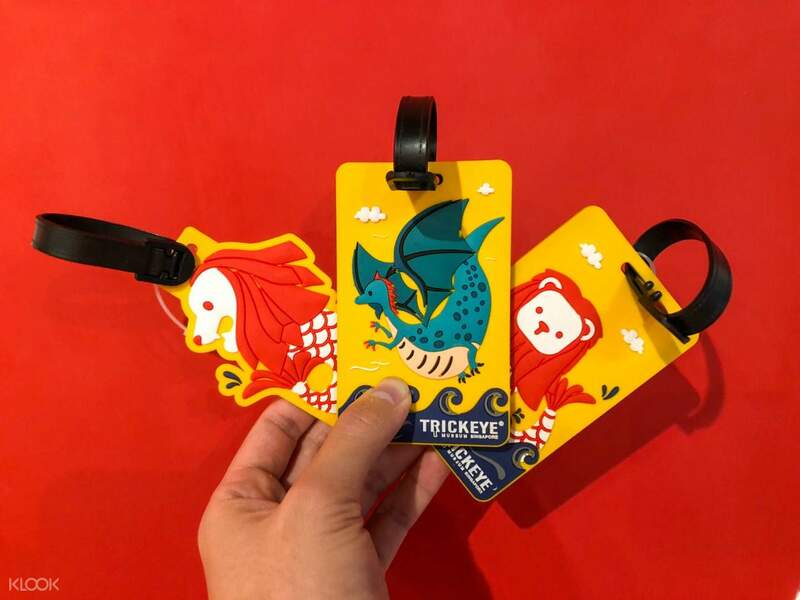 Discover a hidden word that is seen only through the app by downloading the free “Trickeye-Singapore” mobile app from the Google Play Store or App Store, and watch as your photos and videos come alive with hidden animals, magic, fireworks and other special effects! Get exclusive access to these awesome luggage tags by purchasing your tickets through Klook! 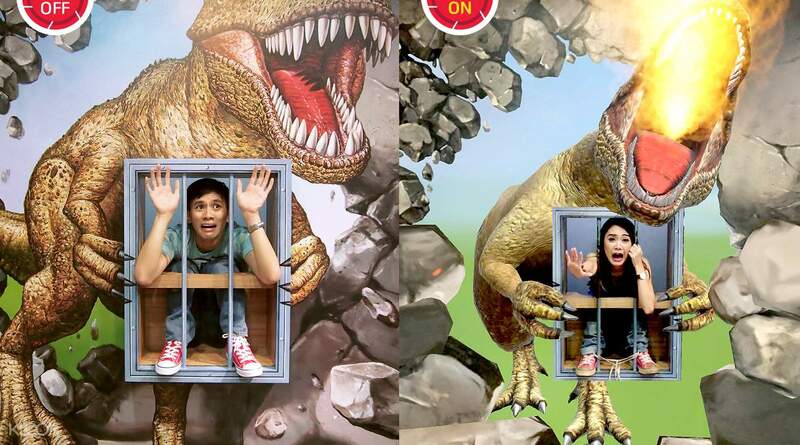 Discover a hidden world in the museum by downloading the Trickeye-Singapore app! We loved this activity very much. The staff there are very friendly and helped us to download the Trick Eye Apps so that there would be special effect when we took photos or videos. The special effects added much fun. We entered the Trick Eye Museum once it open and there were no other customers around. We could take photos and videos at ease. We would recommend this activity to our friends. We loved this activity very much. The staff there are very friendly and helped us to download the Trick Eye Apps so that there would be special effect when we took photos or videos. The special effects added much fun. We entered the Trick Eye Museum once it open and there were no other customers around. We could take photos and videos at ease. We would recommend this activity to our friends. I had a really fun time visiting this museum. Some of the exhibits were Super interesting and funny. The app they suggest to use is good for some exhibits but better to take photos with your camera app as the trick eye app reduces the quality of photos a lot. I had a really fun time visiting this museum. Some of the exhibits were Super interesting and funny. The app they suggest to use is good for some exhibits but better to take photos with your camera app as the trick eye app reduces the quality of photos a lot. Was really fun place 4 the kids. when you enter they will give you the wifi password so download their trick eye singapore app. That way alot of the images become interactive with the camera app combined and you can record them. So cool. Easy to find just go to the large area next to universal studios ticketing counter head over to the left and around the corner. There is a big sign on one of the tubular concrete pillars pointing the way. Was really fun place 4 the kids. when you enter they will give you the wifi password so download their trick eye singapore app. That way alot of the images become interactive with the camera app combined and you can record them. So cool. Easy to find just go to the large area next to universal studios ticketing counter head over to the left and around the corner. There is a big sign on one of the tubular concrete pillars pointing the way. I was having a little hard time finding the museum because it was raining when we went there but once I was in the right place, everything was fast in the counter. They will let you download the app so that you can fully enjoy taking photos. Kinds and Kinds at heart will surely enjoy the museum. I was having a little hard time finding the museum because it was raining when we went there but once I was in the right place, everything was fast in the counter. They will let you download the app so that you can fully enjoy taking photos. Kinds and Kinds at heart will surely enjoy the museum. Very different. It has the option to use VR apps on your smartphone to enhance the photo ops but it isn't imperative. You can do just as well without any app. Just bring a camera. There were just so many it was almost overwhelming with the kids darting this way and that across exhibits. Really enjoyed this one! Very different. It has the option to use VR apps on your smartphone to enhance the photo ops but it isn't imperative. You can do just as well without any app. Just bring a camera. There were just so many it was almost overwhelming with the kids darting this way and that across exhibits. Really enjoyed this one! So much fun! They make it doubly fun for their patrons as there is free wifi that allows you to download and use their app for added special effects. Be sure to bring your inner child with you and you won't go wrong! So much fun! They make it doubly fun for their patrons as there is free wifi that allows you to download and use their app for added special effects. Be sure to bring your inner child with you and you won't go wrong! we were not sure if we can still fit the activity in our sked, so we bought our ticket on the spot and was able to use it right away. we enjoyed the activity especially with the special app they asked us to download, which gives the pictures and videos special effects. we were not sure if we can still fit the activity in our sked, so we bought our ticket on the spot and was able to use it right away. we enjoyed the activity especially with the special app they asked us to download, which gives the pictures and videos special effects. one of the most eye catching places.The app inside the museum gives super cool animations and all the tricks are designed with cool ststues.Must with if you want to add some fun to your trip. one of the most eye catching places.The app inside the museum gives super cool animations and all the tricks are designed with cool ststues.Must with if you want to add some fun to your trip.